Today, Congresswoman Julia Brownley (D-Westlake Village) announced that the Workforce Investment Board of Ventura County (WIB-VC) is one of 20 workforce development boards in the nation to receive a grant from the Department of Labor (DOL) “Linking to Employment Activities Pre-Release,” or LEAP initiative. Today, Congresswoman Julia Brownley (D-Westlake Village) reintroduced the VOW to Hire Heroes Extension Act, which would expand and extend the work opportunity tax credit (WOTC) for companies that hire veterans through December 31, 2018 and allow qualified tax-exempt organizations to make a credit available against payroll taxes for hiring a veteran. Today, Congresswoman Julia Brownley (D-Westlake Village) reintroduced the Innovation, Research, and Manufacturing Act, which would expand and make permanent the research and development tax credit. Today, Congresswoman Julia Brownley (D-Westlake Village) and local officials celebrated the beginning of the U.S. Army Corps of Engineers dredging of Channel Islands Harbor, which will provide sand to replenish Hueneme Beach. In March, Brownley announced that nearly $12 million would be made available for the project. Today, Congresswoman Julia Brownley (D-Westlake Village) offered an amendment to prevent insurance companies from discriminating against women. Brownley’s amendment would stop insurance companies from charging small businesses higher premiums for their female employees, and from selling group plans that deny women contraception or critical maternity care coverage. Today, Congresswoman Julia Brownley released a statement honoring American workers on Labor Day. Today, Congresswoman Julia Brownley (D-Westlake Village) announced more than $600,000 in grants from the Federal Aviation Administration (FAA) for much-needed infrastructure projects at the Camarillo and Oxnard airports. Today, Congresswoman Julia Brownley (D – Westlake Village), announced that the Port of Hueneme will receive more than $400,000 in funds from the U.S. Department of Homeland Security (DHS) through the Fiscal Year 2014 Port Security Grant Program (PSGP). Today, Congresswoman Julia Brownley (D-Westlake Village) announced Ventura County will receive more than $1.4 million from the U.S. Department of Interior through their 2014 Payments in Lieu of Taxes (PILT) program. This is an increase from the $1.3 million that Ventura County received in 2013 under this same program. Today, Congresswoman Julia Brownley (D-Westlake Village) applauded the President’s signing of an executive order prohibiting federal contractors from discriminating on the basis of sexual orientation against workers. In March, Brownley, and more than 100 other members, urged the President to sign such an executive order. 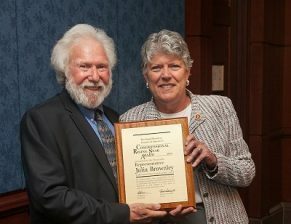 Today, Congresswoman Julia Brownley (D-Westlake Village) unveiled the American Manufacturing Jobs for Students Act (H.R. 4815), legislation intended to provide career education and counseling about local manufacturing jobs for middle and high school students. Today, Congresswoman Julia Brownley (D-Westlake Village) applauded the House passage of the Water Resources Reform and Development Act conference agreement (WRRDA, H.R. 3080). Last night, Congresswoman Julia Brownley (D-Westlake Village) received the Small Business Council of America’s (SBCA’s) 2014 Congressional Rising Star Award in recognition of the strong leadership she has demonstrated in her first term in Congress and her efforts on behalf of small businesses, including her sponsorship of H.R. 3640, the Innovation, Research, and Manufacturing Act, which would expand and make permanent the research and development tax credit. Congresswoman Julia Brownley (D-Westlake Village) and her colleagues sent a letter to Commerce Department Secretary Penny Pritzker in support of the Advanced Manufacturing Partnership for Southern California (AMP SoCal) application for the Investing in Manufacturing Communities Partnership (IMCP) designation, which would help boost innovation and job creation in the aerospace and defense industries in the region. Today, Congresswoman Julia Brownley (D-Westlake Village) announced that the Navy’s Unmanned Helicopter Reconnaissance Squadron ONE would be relocating to Point Mugu, effective immediately. Last week, I was pleased to announce nearly $12 million in federal funds for the dredging of the Channel Islands Harbor and $10.5 million for the Ventura Harbor dredging project. It’s a big win for Ventura County, our harbors, Hueneme Beach and Ventura County’s economy. Today, Congresswoman Julia Brownley (D-Westlake Village) and Congressman Mark Takano (D-Riverside) introduced the Help Hire Our Heroes Act, a bill that would extend the Veterans Retraining Assistance Program (VRAP) for six months. This extension of the VRAP authorization and additional funding would allow veterans to participate and would pay veterans VRAP benefits through September 30, 2014.